At this time of year, the words above go through my mind, and often pass my lips, in a bad Katharine Hepburn accent (with apologies to calla lilies). Old-fashioned lemon lilies (Hemerocallis flava) are among the legacy plants in my garden. Along with the morning glories (Ipomoea purpurea) and purple irises (Iris), the lilacs (Syringa) and mock orange (Philadelphus), lemon lilies have probably been blooming at my house since it was built in the late 1920s [Ed: Actually, it turns out that our house was built in 1919]. Mustn’t forget the soapwort (Saponaria officinalis)… but that deserves a post of its own. 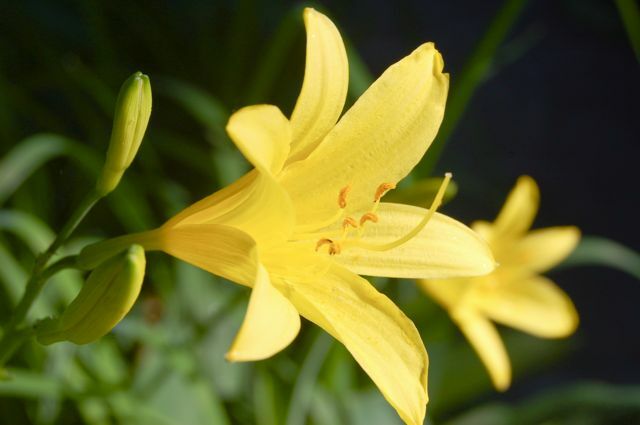 Sweetly fragrant, lemon lilies are one of the many-times-great-grandparents of all the scented daylilies that followed. I have them on either side of my front walk. Though they don’t grow as prolifically as they might in a sunny, moist location, they never fail to put out a few perfumed blooms to inhale as you pass. Another patch grows beside our tiny front porch. Sometimes when sitting there, you get a heady blend of the June trifecta: lemon lilies, mock orange and the jasmine scent of Hall’s honeysuckle (Lonicera japonica ‘Halliana’). Perhaps over the next couple of days, the weather will actually be cool enough to enjoy it.